After receiving flowers at the food line, our off-site meeting at Foothill High School was called to order at 7:05 by President Denise, assisted by Interact President Alex Jensen. Foothill’s BBRC liaison, Bree Goodmon, shared an inspirational moment that was a short video entitled “Lessons from Geese.” Alex led us in the flag salute and Bill Black led us in “God Bless America,” which several Interactors didn’t know. Alex thanked all Rotarians and Interactors for attending this morning. He also introduced the Foothill Interact Advisor, Jan Graves, and Foothill Principal, Gail Bentley. President Denise explained to the Interactors that each BBRC meeting follows a format which recognizes important moments in our members’ lives. Today there was one Rotary anniversary: Jason Williamson, 15 years. Two members had birthdays this week: Dale Bender and Mary Breckenridge. She asked any Interactors who had April birthdays to stand up; 2 girls did and we sang “Happy Birthday” to them since neither Dale nor Mary were present. Interact President Alex had several of his members come to the front to explain about the activities their Club have been involved in this year. They had a Nickel, Dime and Quarter fundraiser and raised $1200 over 3 days! This was distributed among 25 families. Vicki Pone shared some pictures and words about helping at Kern County Museum Safe Halloween. Clarissa Alonso shared her experience with Wreaths across America. Clair Champagne shared the experience at San Miguel Grove clean up. She mentioned the 3 activities that they all assisted in: picking up trash, picking up dead brush, and digging holes for new trees. Jackie Cabrere said they have helped two times with Bakersfield Highway clean up. Side comment: some of the stuff they found was gross! Blas Gonzales shared his experience at KernYES. He was impressed with the ethics and diversity topics as they caused him to look at issues from a different viewpoint. 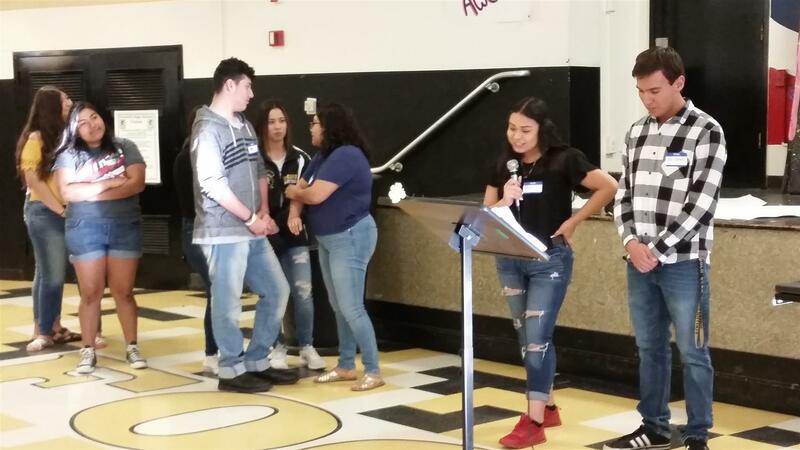 Brianda Figuera shared her experience at Leadership and Ethics conference. This was her third time to attend and she encourages classmates to join her each year. Alex then asked everyone if there were any questions for each other. Leslie VoVilla asked the Interactors if they had any more projects planned, and they said no. Mary Jo thanked the Interactors for helping at Wreaths. 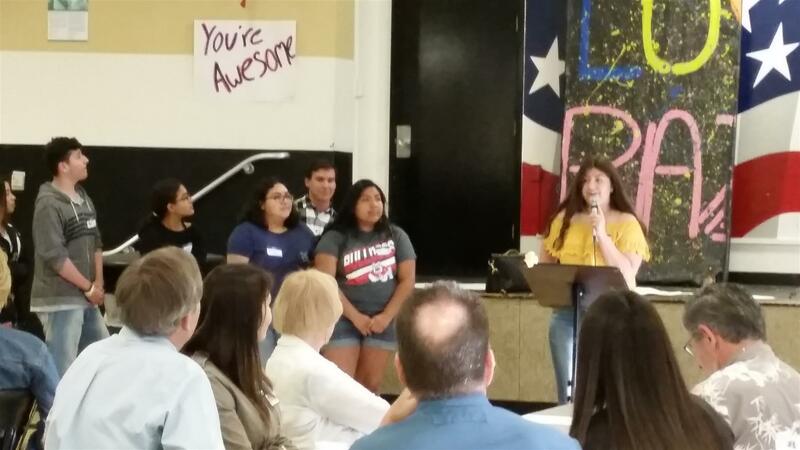 Several Rotarians mentioned some of our upcoming projects for the students to assist with: Sandy mentioned 1,000 Flags; Jackie mentioned next San Miguel Grove clean up on April 28; Denise mentioned the all-Rotary food activity on May 5. Mike O’Doherty mentioned a few international projects that might interest them: SEAL Center tumbling mats; funds for the orphanage in Tijuana; also, the “teaching moms” project. Final agenda item was Happy Spots. 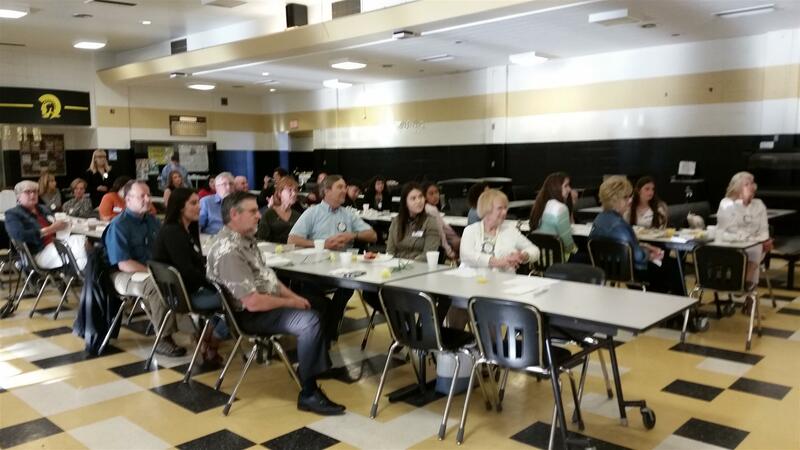 Denise explained that the twist would be BBRC will donate $5 to Foothill Interact for each one mentioned. This prompted several students to stand and say they were happy for good GPAs, graduations, baby’s first words, college schedules, upcoming trips, improving mile times, and acceptances into upcoming academic programs. BBRC members shared, too: Leslie is glad her mom is moving back to Bakersfield; Ron gave thanks to Mike and Jackie for grants to be used for his upcoming term; Denise shared again that she will be a grandma twice; Marilee is finally going to the coast after a couple cancellations; Jackie is going to Tucson; Mike is travelling to Portland then Yuma for family visits; Tom is going to Boston and Denise asked if he was running the marathon next Monday; and Jeff Bell’s daughter is competing for a spot in the Ford Dimension program. I’m not sure exactly what the final total was, but it was more than $5! Our meeting was adjourned at 7:45, even with the principal’s blessing for students being late for first period.